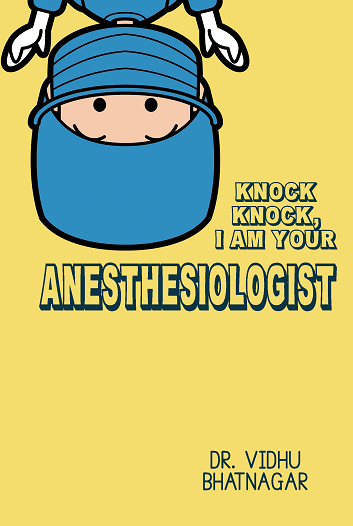 “Knock, Knock….I am your Anesthesiologist!” is a book, which is written from first hand, personal experience of the author in which she pens down her stimulating journey during the three demanding years of her post-graduation in the unfathomable subject of Anaesthesiology. This branch of Medicine is an enigma in itself and very little is known about it to not only the non medical population but also to the junior doctors, because it is not dealt with earnestly in undergraduate years. The American Society of Anaesthesiologists define Anaesthesiology as "the practice of medicine dedicated to the relief of pain and total care of the surgical patient before, during and after surgery." Anesthesiology, which is a relatively new branch has managed to spread its tentacles in almost all other specialties and these days there is hardly any stream of Medicine or Surgery which does not require the expertise of Anaesthesiologists for either diagnostic or therapeutic purposes. From its humble beginnings of the first public demonstration of anaesthesia at the Ether Dome in Massachusetts, on October 16, 1846, the youngest specialty of Medicine has made great strides in development and has evolved into one of the safest specialty in medicine, finding its parallel in the Aviation industry. Since this book is written from personal experiences many people may be able to relate to it; the Operating Room assistant, the post graduate resident, the anaesthesiologist & any professional at large. It is also a lucid writing for anyone who would like to understand the cryptic world of Anaesthesia. The recognition of this branch of medicine is suboptimal especially in India, despite the efforts put in by Anaesthesiologists towards patient safety. Thus, this book also has been written as an attempt to make Anaesthesia, a recognized branch of Medicine. This book is also dedicated to all the Resident Doctors, who untiringly work day and night, towards the well-being of their patients: Resident Doctors, who work tirelessly, without food and sleep, despite being underpaid most of the times, with no guarantee of their safety from the reckless, relatives of the patients at any point in the discharge of their duty! Dr Vidhu Bhatnagar completed her graduation in 1999 from AFMC, Pune and has been practicing as a full time professional, since then. She proceeded to commence her post-graduation in Anesthesiology in Dec 2003 and successfully completed the same in May 2007. She was blessed with her first born in August 2006 and the second born in Jun 2009. She commenced her super specialization in NeuroAnesthesiology in Jan 2011 and successfully completed the same in Dec 2013. 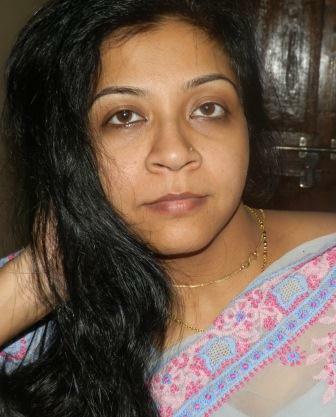 She is presently working at a tertiary care hospital as an Associate Professor and Neuroanesthesiologist. The changing times in the society where Doctors are being blamed for everything and a kind of villainy is attached to them, she assumed it as a moral responsibility to make the society aware about the hard work, sweat, tears and blood which goes into making of a specialist doctor. She, being an Anaesthesiologist, also realized the need to make people aware about the stream Anaesthesiology because though Anesthesiologists are ‘behind the mask’ doctors and ‘unsung heroes’ but, nonetheless are a very important part of the surgical team. The stress of pursuing higher education, handling relationships and managing kids was overpowering and it took some time for her to realize the ways and means to handle everything optimally. She became an ardent follower of alternate healing practices including Reiki and Pranic Healing during this journey. She also is a Tarot card reader and Oracle Card reader and paints ‘Mandalas’ for relaxation. She is a devout follower of inherent goodness in one and all and strictly believes in spreading happiness and the message of ‘attitude of gratitude’. These lessons learnt during her journey as a resident doctor during her postgraduation have been woven into this book. This book is an attempt to decipher Anaesthesiology as a stream to common people as well as the junior doctors, it is also an attempt to thank all the teachers, who selflessly work towards the improvement of resident doctors, it is also an effort to acknowledge the hard work and dedication which is displayed by the resident doctors in an endeavor to master their chosen subject. * the prices are for a maximum 250 BnW inside pages (60,000 words) paperback.